I’m in Chicago this week and, unfortunately, suffering from a head cold. I rarely catch anything, but woke up yesterday morning unable to taste or smell; in fact, I’m pretty much numb from the nose up. This is why Wine Review Wednesday didn’t happen yesterday. In fact, I was hoping I’d be better today and able to do some tasting at the bar here, but it’s just gotten worse. So we’ll just skip this week and hope for a clearer path to tasting next week. In the meantime, then, I thought I’d link up a story about the only aspect of wine that I can appreciate right now: Its color. 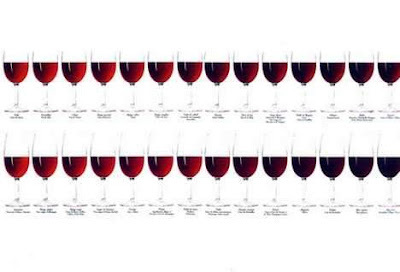 The other week, in his blog The Pour that he writes for The New York Times, Eric Asimov addressed an interesting topic that’s far too often ignored: The importance (or not) of a wine’s color. It’s an interesting questions, and one with serious implications both in terms of consumer preferences and the nature of the kinds of wines that get produced. As more consumers taste a broader range of wines, and as they begin to understand that aroma and flavor, more than anything else, define a wine, I hope that they’ll start to realize that darker wines are absolutely no better than pale ones. The truth, as always, is in the aroma, flavor, and overall balance of the juice. That other stuff is merely aesthetic. Sometimes, a story is published that, though it has little bearing on the wine lives of the vast majority of us, brings a smile to the face anyway. That’s exactly the kind of piece that I saw this morning on the web site of Scientific American Magazine. So here’s the issue: How can the winner of the bottles ultimately be positive that they are, in fact, what they’re supposed to be, and not well-crafted fakes? Easy, notes the article: Let atmospheric radiation do the work. Wine fraud has become a major issue, especially as prices have climbed through the stratosphere. 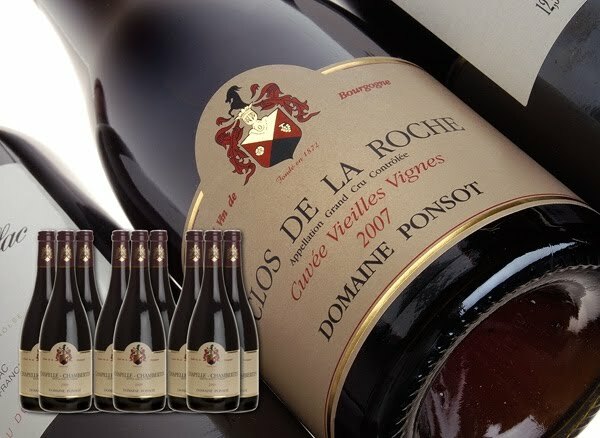 And in recent years, with the publication of books on the subject (my personal favorite is The Billionaire’s Vinegar by Benjamin Wallace), and with well-publicized instances of fakes winding up at auction (the Domaine Ponsot scandal, linked up right here, is a great example), the authenticity of great old vintages is on everyone’s mind. Now, with this technology, there seems to be a way to fight back. And a pretty fascinating one, at that. Barrel-tasting season is upon us, at least for the big magazines. James Suckling announced on his Wine Spectator blog this past Friday that he was heading to Bordeaux to begin his early tastings of the much-heralded 2009s. Of course, it’s still early in the game: Seven months ago, the grapes were still growing on their vines. But, as I covered here last year, the word was that that fruit had the potential to produce wines that could possibly rival those of the great vintages of the past fifty or one hundred years. As a result, the level of excitement about these wines is already exceptionally high. And though the wines themselves are far from finished, these preliminary tastings will provide a useful guide for consumers when it comes to deciding whether or not to participate in the 2009 vintage’s en primeur campaign. Regarding our own barrel tasting here at Wine Chateau--last week, we had the chance to taste a number of Louis Jadot’s 2008 Burgundy offerings, including standout Chassagne- and Puligny-Montrachets and a magnificent Echezeaux Grand Cru--I’ll post my impressions of the wines, as well as some short video from the event, right here in the next week or so. Just a bit of food for thought (or, rather, drink) as we head into the weekend. Earlier this week, Wine Enthusiast Magazine posted a column on its web site by Joe Czerwinski about the importance of a wine's label. The title of the piece ("How Much Does the Label Matter?") deals with an ever-more relevant question that consumers are faced with. As all of us become more marketing savvy, and as we all have learned to tune our proverbial antennae to the smallest details of branding, product placement, and brand identity, wine producers and marketers have stepped up their efforts to make their products as appealing as possible. There is nothing wrong with this. I couldn't agree more with Mr. Czerwinski, however, when he notes that, "What’s in the glass is what counts, and that’s something wine writers have espoused for decades, if not centuries. If a wine tastes good to you, it shouldn’t matter...what the label looks like." But that's a difficult trick to pull off, especially as a consumer faced with shelves of often unfamiliar bottlings. Just something to think about the next time you start to shy away from a bottle of, say, Riesling Spatlese Wehlener Sonnenuhr, or Pernand-Vergelesses 'Les Vergelesses' simply because the names and labels are a bit complicated. Branch out, take a chance, and don't be afraid to ask questions when you're buying wine. You'll exponentially increase your chances of finding your next favorite bottle if you're willing to break out of your comfort zone and try something whose name may be a bit intimidating or whose label may not be as 'charming' as you'd like. In the end, it's the juice that counts above all else. With springtime finally threatening to come to town after a brutal winter here on the East coast, it's time to start thinking about wines that look forward to the warmer days ahead. 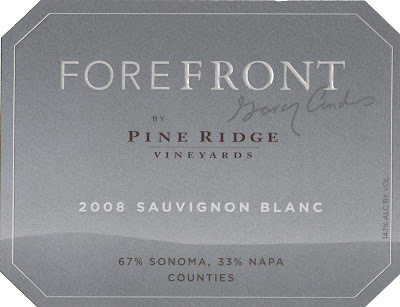 I have a hard time imagining a better way to kick off the season than with the ForeFront (by Pine Ridge Vineyards) Sauvignon Blanc 2008. It starts off with fruit that tends in the direction of peach and pineapple, though that brightness is complicated by creamy notes of green bell pepper and something that reminds me, charmingly, of spinach dip. A hint of white-blossom flower lends it all a sense of prettiness. The palate, on the other hand, is surprisingly compact and mineral, with green apple and blue slate, as well as nicely balanced acidity. You might even find a touch of pleasantly bitter walnuts in there. This is a subtle, well-crafted Sauvignon Blanc, a versatile pairing partner at the table, and an excellent prelude to the season. And, after the winter we’ve just had, a well-deserved treat. We’ve covered wine’s impact on the environment here before, and from more natural farming practices to the materials in which wines are shipped, it has become clear that, in general, there is a real and serious movement toward making the wine industry more environmentally friendly. And, if you followed my posts from Champagne last September, you saw how important respecting the land is to that region in particular. 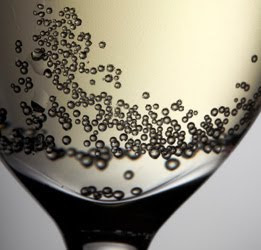 Unfortunately, one of the main environmental threats that sparkling wines inherently pose is the thickness and weight of the bottle. After all, in order to safely withstand the pressure of the bubbly inside, Champagne bottles traditionally had to be thicker...and therefore heavier. 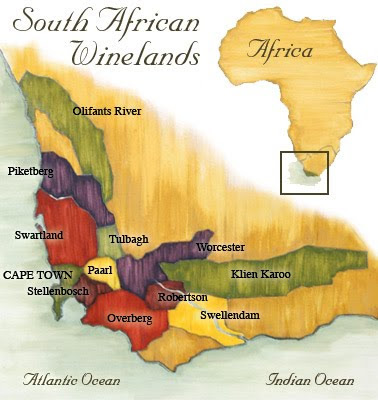 This resulted in an environmental domino-effect of sorts when it came to moving the wines around the world. This is a big leap in terms of both real-world impact and symbolism. Regarding the former, it is yet another step toward the Champagne region’s self-imposed goal of “cutting carbon emissions by 25 percent by 2020. The new bottle standard,” the press release continued, “is one of the initiatives to help meet this target. About 300 million bottles of Champagne were produced last year,” so a two-ounce difference in bottle weight will add up very quickly. In terms of the symbolic import of the formal approval of the bottle, it’s just as big. After all, Champagne is synonymous with luxury and glamour, which, for far too many people and for way too long, seemed to exist on the other end of the spectrum from something as literally earthy as the environment. Those two ends have been drawing ever closer lately, however, and this announcement, this bottle, is a very positive step in the right direction, as well as yet another indication of the wine world’s commitment (and Champagne’s commitment in particular) to the earth that literally sustains its business. This is good news for fans of Austrian wine in particular, as well as for the Austrian wine industry in general. After all, the identification and classification of ever more specific appellations within the country not only makes it easier for consumers to differentiate between the various parts of Austria’s wine-producing areas, but it also highlights the distinct differences between them as manifested in the wines themselves. In other words, just as, say, Pauillac and St.-Julien are home to two uniquely different expressions of the larger Bordeaux region, so, too, is this naming of the Eisenberg DAC an identification of a unique, special area within the overarching Burgenland appellation. “Like all of the other DACs, Eisenberg DAC is subject to the general conditions and requirements for Austrian quality wine. 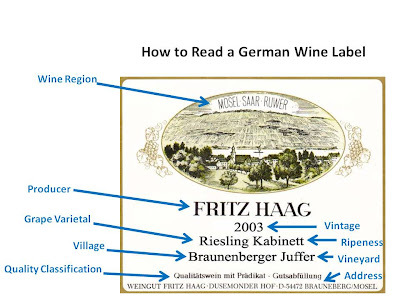 Specifically, Eisenberg DAC wines must be produced from 100% Blaufränkisch grapes. “Eisenberg DAC stands for the typical, fruity and mineral-spicy Blaufränkisch, which is further characterised by the loamy, mineral-rich soils of the Südburgenland wine-growing area. 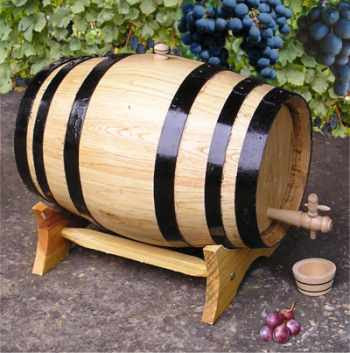 The wines can be matured either in steel tanks or in wooden barrels, but the wines should show no – or else barely noticeable – wood tone. “Eisenberg DAC wines also may be marketed with the additional designation of ‘Reserve.’ These are complex wines with great storage potential. They must be matured in large wooden barrels or in barriques, allowing for the aromas and flavours of Blaufränkisch to be complemented by wood notes. This means that the first Eisenberg DAC wines will hit the market on September 1, 2010 at the earliest. In the meantime, a bit of homework now--on the wines of Austria in general and those produced from the Blaufränkisch grape variety in particular--is in order. In other words, drink up: It's the tastiest homework you can imagine. Eric Asimov’s column in this past week’s New York Times Food Section deals directly with the 2007 red Burgundies but, really, is about far more than that. Indeed, reading between his lines, it seems as if there’s an important lesson in there for all of us regarding vintage, reputation, and the truth of the juice in the glass. That’s a telling statement, and taps into a wine zeitgeist that, thankfully, seems to be fading--or, at the very least, shifting--a bit. 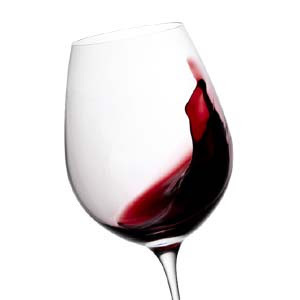 After all, a glass of classic red Burgundy, at its best, offers an in situ example of terroir expression, of the minute differences that make a wine from one village or vineyard such a unique thing. For a while there, of course, this ran counter to popular taste, and among far too many consumers, a delicate, finely etched Pinot Noir, no matter where it was from, was often looked upon as somehow lacking. Fruit and power, in other words, had overwhelmed finesse and a sense of place. As more consumers become familiar with the concept of terroir, the concept of a wine transmitting some ineffable truth about a particular patch of the earth, vintages like Burgundy’s 2007 will continue to grow in popularity. After all, the best of these wines “will not only provide a good deal of early pleasure, they will age well and offer great opportunities for exploring the often subtle differences among Burgundy’s varying terroirs,” Asimov notes. 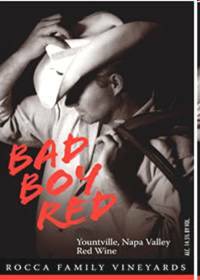 “From careful producers who did their work,” he adds, “the reds offer unusually transparent expressions of Burgundian terroir, which can differ not only from village to village but from vineyard to vineyard. 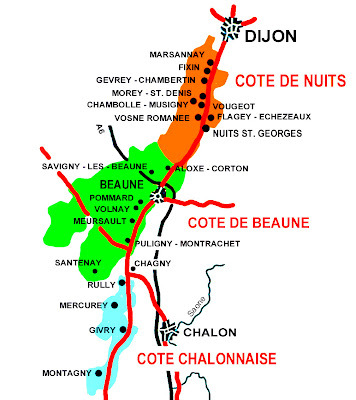 And that, really, is what the wine of Burgundy is all about: Its mind-bogglingly long history, and the way its villages and vineyards have been explored and mapped out for centuries, all contribute to wines that, at their core, are inextricably linked to the land in which they are grown. No matter what the current taste might be, and regardless of reputation, a vintage like 2007 here seems to be as honest, as typical, as we could hope for. And that’s a very good thing. Sometimes, there’s a sense of poetry to the timing of a news item’s publication. Consider the one I’ve linked up here from The New York Times (which I saw today in my hotel room in Las Vegas, after another big meal): It reports that there is finally some scientific justification to what wine lovers have known forever. Wine with dinner is good for digestion. According to the article, some recent studies “have found that alcoholic beverages speed the emptying of food from the stomach and stimulate gastric acid” (others, the article notes, have reached no such conclusion). Take a look at the entire piece and decide for yourself. Or, better yet, open a bottle of wine with dinner and ponder it over a good pairing. If you believe what The Times reports, it may very well benefit both your brain and your belly. To say nothing of your tastebuds. This has been a great week of tasting and drinking (two very different things...and, typically, while I do a great deal of the former, the latter is often rather limited). I attended a fantastic Barolo tasting for the Wine Media Guild this past Wednesday, and had the chance to assess the 2005 vintage in a 25-bottle horizontal divided into the various crus of the region (Brunate, Sarmassa, Cannubi, etc.). And yesterday, I attended a fascinating seminar and press tasting of the spectacular new Louis XIII Rare Cask Cognac that was led by Remy Martin’s Cellar Master, Pierrette Trichet. I’ll be reporting on both of these tastings in the coming weeks. As for the drinking--and I know: I should have posted this note on Wine Review Wednesday--that highlight took place last weekend, at a dinner I enjoyed with my family at Philadelphia’s R2L restaurant to celebrate my birthday. Once we were seated--right at the window, 37 floors up and with an amazing view of the city--a gift bag was delivered to the table. In it were two of those glass jars that homemade jelly and jam are stored in, and I knew immediately who was responsible: My friend Scot ‘Zippy’ Ziskind, who I’ve written about here a number of times before. Whenever he opens up a great bottle, he saves a bit of it in these jelly jars so that his friends who were not there when the bottle was originally uncorked can enjoy it. And, man, were these two serious birthday wines: A 1966 Chateau Latour and a 1970 Chateau d’Yquem. Both were fabulous--fully mature and at the sweet spots of their drinking windows. And while I loved them both, the Sauternes, for me, was the wine of the night. The nose led off with a wild combination of apricot, honey, pronounced toffee, golden chanterelle, and spice notes. 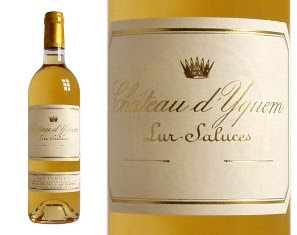 In classic Yquem fashion, the sweetness of the botrytized fruit was secondary to its perfume and its hint of earthiness; those chanterelles from the nose were also present on the mid-palate, though balanced out there by still-surprisingly-fresh pineapple, exotic spices, and bright, singing acidity. The texture was breathtakingly silky, and I could still feel it on my tongue throughout the minutes-long finish. With apologies for the phrasing, what a sweet way to celebrate a birthday. You can't open up a wine magazine or speak with a winemaker these days without hearing all about the countless ways that the environment is being taken into careful consideration in this industry. From sustainably farming grapes to producing wines in as organic a manner as possible, the earth, it seems, has become just as much of a consideration as the fruit and ultimately the juice it produces. Of course, growing grapes with the environment in mind often results in better, more expressive wine. 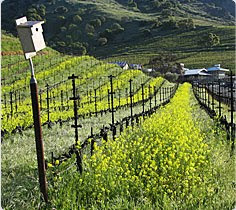 It just makes good sense: The fewer chemicals that are added to a vineyard, the more clearly the land can express itself without anything getting in the way. I was asked to explore this concept, with a focus on the new release of the Shafer Red Shoulder Ranch Chardonnay (the 2008), for an excellent new online publication, GoodLifeReport.com. Click here for the full article and the tasting note: The wine, as expected, was magnificent even this early in its evolution, and a fantastic example of just how important it is to consider not just the juice in the bottle, but the environment in which the grapes grew up in. 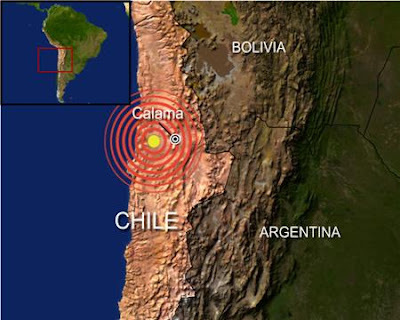 It will be some time before we know the full toll that this tragedy has taken on Chile in general and on its wine industry in particular. In the meantime, I’ll be making a point of buying as much Chilean wine as I can in the coming weeks and months in addition to whatever money I donate to rescue efforts. It’s not much, of course, but sometimes, a little show of symbolic support is all you can really do. For the time being, it will have to suffice. This is big, and not just for the parties involved. It seems to signify a shift in how wine is perceived around the world, and how national wine industries that just a few short years ago seemed destined primarily for niche success are now, in fact, making significant impacts in markets more far-flung and diverse than most people would have predicted. But that’s the way of the wine world: It is a constantly shifting place, and if the quality is where it needs to be, then great wine, no matter where it’s produced, will find its audience. Such is the case--at least producer Kanonkop is hoping--with what is being called the most expensive Pinotage on the market. This is a grape variety that, while it has its ardent fans, is generally not considered to produce the kind of wine that can justify such a high price tag. But that hasn’t stopped top producer Kanonkop from releasing this one, their 2006 Black Label, priced at 1,000 South African Rands, or approximately $130 (it’s going for £83 in the UK). As soon as I have the chance to taste it, I’ll report back right here. You never know: It could be a game-changer. I certainly hope so.